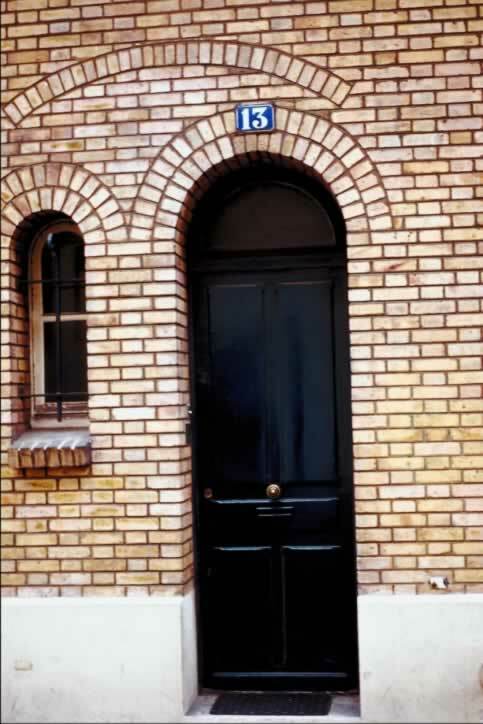 Though this black wooden door may appear to be arched, the door is a regular, rectangular four panel framed door. However, the transom and the enframement of the fanlight (semi-circular window above a door) are all finished in the same black enamel, giving the appearance of an arched door. The window is a great feature as this particular wall has very few and small windows, which does not allow for much natural light to enter the residence. The two top panels of the door are raised. Above the door's mid rail on the muntin (the center stile running vertically down the center of the door) is an antique-style door bell in a bronze finish. A mail slot is located beneath the door bell in the door's mid rail, but is difficult to see because it has been painted black.